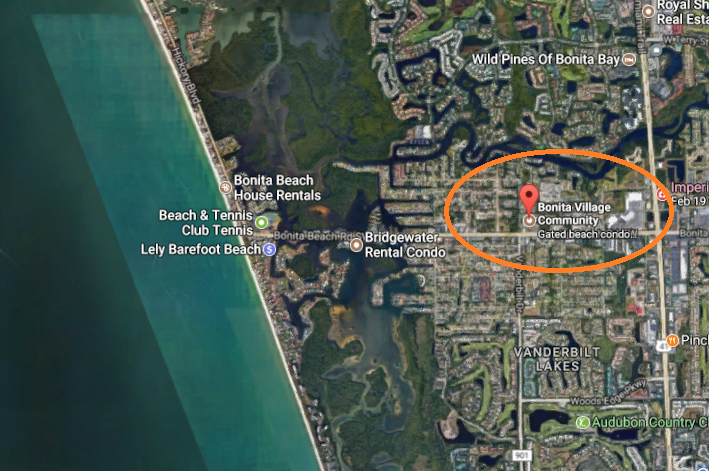 Bonita Village of Bonita Springs is a condominium complex located west of 41. The community, built around the year 2007, is one of the newer complexes in the area considered to be within walking or biking distance to Bonita Beach. There are a total of eighty units with approximately fifteen units per building. Each building has a common elevator servicing the four story structures. The units at Bonita Village range from one to three bedrooms. Views from the units include a variety of landscaped areas, other building or common areas with some having a lake view. Amenities at Bonita Village include community swimming pool with spa, exercise room, community clubhouse/cabana, extra storage and more. The appeal of Bonita Village is the close proximity to the beach, the newer construction/building codes and the favorable lease structures which allow weekly rentals. Nearby conveniences also include a Publix grocery store moments away, many shopping and dining establishments nearby and Coconut Point Mall is only about fifteen minutes away. Nearby condos with similar location, design and values include Bonita Beachwalk, The Carlysle and Bonita Beach Plantation House. Subscribe to our Bonita Springs Florida Newsletter by adding your email address!